According to a new University of British Columbia (UBC) research, cyclists should be riding at speeds between 12 and 20 km/h on city roads, while pedestrians should be moving at 2 to 6 km/h to minimize their inhalation of air pollution while still getting the health benefits of exercise. "The faster you move, the harder you breathe and the more pollution you could potentially inhale, but you also are exposed to traffic for a shorter period of time." 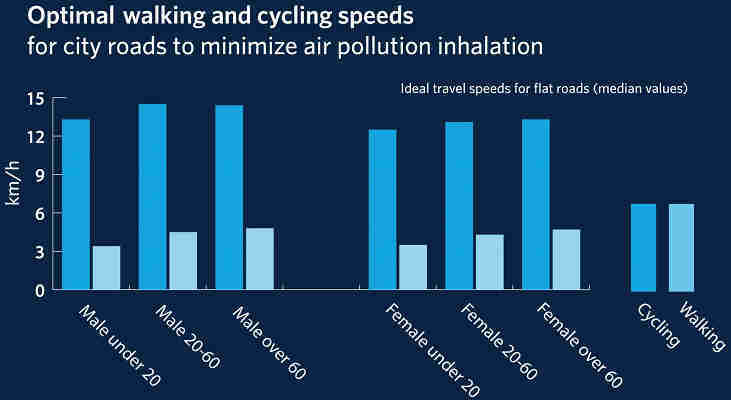 Ideal travel speeds were at 13 and 15 km/h for female and male cyclists in the 20-60 age group. This research explores the same problem recently reported here, where it was analysed the maximum number of weekly hours riding a bike before the harm due pollution was worse than the benefits derived from exercise.